B Vitamins Protect Against Harmful Epigenetic Effects of Air Pollution | What is Epigenetics? Air pollution has a negative impact on our health and can also adjust important chemical tags on our DNA. Aside from taking steps to reduce pollution in our communities, a new study suggests that we can take B vitamins to combat the harmful effects on our bodies. Particulate matter with a diameter less than 2.5 micrometers, or 3% of the diameter of human hair, is known as PM2.5. These fine particles have been shown to wreak epigenetic havoc on our DNA, increasing our chances of a stroke, Alzheimer’s disease, Parkinson’s disease, cognitive impairments and neurodevelopmental disorders. Previous studies have found that hundreds of genes can be affected by inhaling widespread pollutants, such as diesel exhaust fumes. The study, conducted by a group of international researchers from the U.S., Canada, Sweden, Singapore, China, and Mexico, administered a B vitamin supplement to healthy non-smokers not taking any other vitamins. The supplement consisted of 2.5 mg of folic acid, 50 mg of vitamin B6, and 1 mg of vitamin B12. Compared to the group that received the placebos, the supplements increased the participants’ plasma concentrations of these three vitamins. The team collected ambient particles from a busy street in downtown Toronto that has more than 1,000 vehicles pass every hour. An “oxygen type” facemask was used to deliver the particles to participants. Epigenome-wide DNA methylation profiling was conducted before and after each experiment. Overall, they found that the fine particles induced methylation changes in genes involved in mitochondrial oxidative energy metabolism. Air pollution was shown to disturb DNA methylation profiles, which could exacerbate oxidative and inflammatory responses. B-vitamin supplementation was able to prevent these changes. Although administered in the form of a supplement for the purpose of this study, these B vitamins can be found naturally in many food sources. Folate is found whole grains, fruits and vegetables, and beans. Vitamin B6 is especially abundant in dark leafy greens. Fish, poultry, meat, eggs, and dairy all have vitamin B12. DNA methylation is a well-known epigenetic mark that suppresses gene expression. By understanding the effect air pollution has on our DNA, we can search for potential ways to combat these negative effects. According to the American Lung Association, 47 percent of Americans live in counties with frequently unhealthy levels of either ozone or particulate pollution. 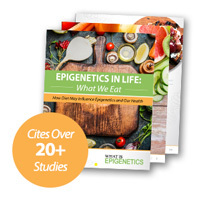 With epigenetics becoming more and more prevalent, we can begin to understand the underlying molecular triggers caused by environmental toxins and other variables that harm our health. Armed with this new information, we can start making informed decisions on how best to stave off disease and the detrimental effects of certain environmental exposures all around us. Source: Zhong, J. et al. (2017). B vitamins attenuate the epigenetic effects of ambient fine particles in a pilot human intervention trial. PNAS, 114(13):3503-3508. Reference: Columbia University. Taking B Vitamins May Reduce Epigenetic Effects of Air Pollution. Public Health Now. 30 Mat 2017. Web.